Hvožďany area is inhabited since the prehistoric ages - excavations showed settlements from Bronze Age as well as younger eras. The first written mention is from 1352 when Hvožďany church is mentioned in the papal register of villages which pay the tithe. Anyway the village was probably founded in 11th or 12th century because it is located on important road crossing. Owners of the village changed quite often in the 15th and 16th century. Some of them owned the village for just few years, other for few decades. Hvožďany was divided into parts and some of the owners owned just some of the houses. 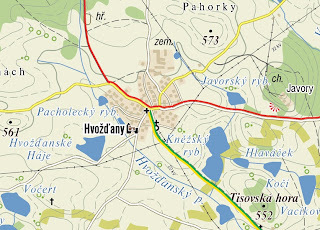 The domain was bought by the Vratislav z Mitrovic family after Thirty years war and they connected it to the Lnáře domain where Hvožďany belonged until the administrative reform in 1848 (two censuses from Lnáře domain are available online in Třeboň digital archives). 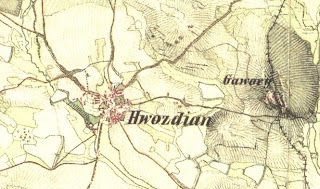 Hvožďany is located in typical agricultural area - most of the inhabitants were farmers (or helpers, hinds on large farms), some of them were craftsmen and so on. We find a cooper, a blacksmith, a miller, a shoemaker or a taylor there in the beginning of 19th century. Local church of Saint Procopius and Annunciation of Virgin Mary was build in the second half of 13th century or in the beginning of 14th century. It was built in gothic style which is still visible on the church, even the fact that it was rebuilt and changed several times. It didn't have a tower so there was built a baroque bell tower next to it. Hvožďany belongs under State Regional Archives in Prague and also under SRA Třeboň. It has its own parish since 1786 (SRA Prague) and the parish books are available online till 1909 (births), 1911 (marriages) and 1920 (deaths). It belonged to Bělčice parish (SRA Třeboň) between 1680 and 1786 and to Bubovice parish (SRA Prague) between 1639 and 1680. 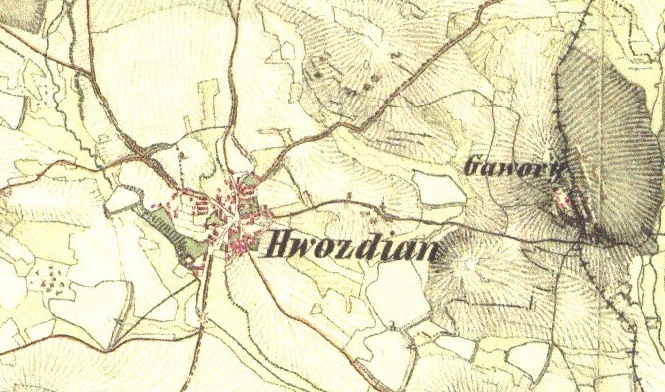 The oldest registry for Bělčice parish shows following surnames in Hvožďany between 1681 and 1687: Bálek, Burian, Čech, Halík, Hoblík, Jedlička, Kazda, Kozák, Kříž, Krákora, Netušil, Pobuda, Staněk, Tůma, Vodička. Oh! Thank you for featuring "my" village! No problem, I plan to add some other of them. :) Just need a bit more time - I'm overloaded with Christmas projects right now and everything other goes terribly slowly.